New farming practices hold promise for both farmers and the environment. A major solution to help slow climate change may be just below our feet. Specifically, says Marc Kramer, an assistant professor of environmental chemistry at Washington State University Vancouver, it's in the soil, which holds more than three times the carbon found in the atmosphere. And for years, Kramer has been studying how farming practices can trap carbon dioxide and offset greenhouse gas emissions contributing to global warming. It's called carbon sequestration. And Kramer thinks it could be a win-win for farmers and the environment. "It could put a significant dent in the fate of the Earth's climate over the next 100 years," he says. It's part of how Kramer and other researchers want to "rethink agriculture." As the world population continues to grow, agricultural lands will be repurposed, forests will be cleared and demand for food will grow. That creates an opportunity for innovation, a chance to not only make farming practices more sustainable, but also to absorb and trap carbon dioxide from the atmosphere, Kramer says. In a paper he helped write in Annual Review of Ecology, Evolution and Systematics, Kramer found that more than half of the global soil carbon pool is more than a foot below the surface. And most of that is chemically bound to minerals. So Kramer, along with researchers elsewhere in the region, thinks it may be possible to accelerate the process of storing carbon in the soil by radically changing how farming is done. "The way we approach it is we want to throw all that out the window and rethink everything," Kramer says. For centuries, the only way people knew how to farm the prairies of the Palouse was to plow and cultivate the soil, says Ty Meyer, executive director of the Pacific Northwest Direct Seed Association. "It was a tried and proven method," Meyer says. It was profitable, but it came at the cost of high soil erosion rates and depletion of organic matter. But some farmers in the Pacific Northwest are already adjusting how they farm in a way that's more climate friendly. The Pacific Northwest Direct Seed Association advocates for "conservation tilling" farming systems. Essentially, the idea is to till the soil less. That can save on fuel costs, for one, Meyer says. And it helps prevent soil erosion. 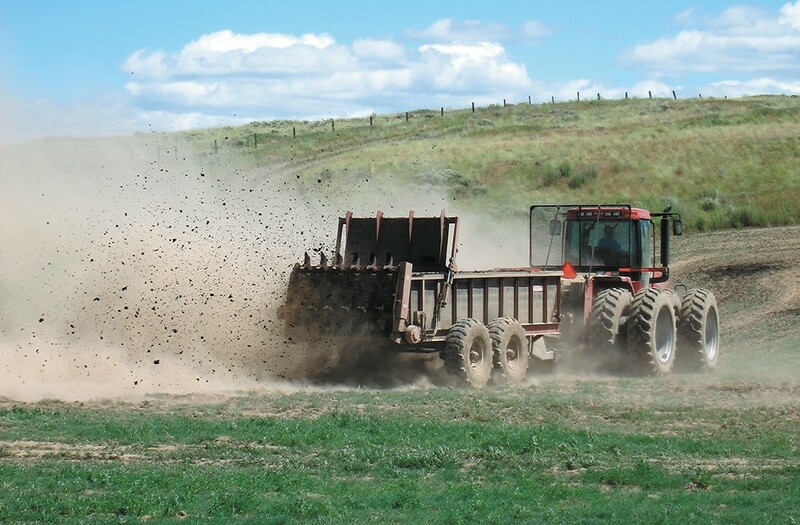 Yet tilling can also release greenhouse gases from the soil into the air, says William Pan, a WSU professor who recently helped author a paper on climate-friendly farming practices. "When you stir soil up, you lose oxidation and a lot of organic matter," Pan says. "So all of that has gone into the atmosphere as a greenhouse gas emission." There are several ways to help restore that organic matter, like having different crop rotations and better soil management. It requires a higher level of management of weeds and disease control, Meyer says, but there's technology to work around that. And the yields don't suffer with conservation tilling systems like they did decades ago, Meyer says. "The equipment is so much better today than it was in the past, and the programs have never been better to help [farmers]," Meyer says. There's some incentive for farmers to adopt these strategies, Pan says. Farmers will see a long-term benefit with their soil health, for example. But the short-term benefit isn't always there. That's why, he says, there should be "some government incentive to get the ball rolling." The effect on the climate is that it could both prevent future greenhouse gases from being released to the atmosphere and absorb them from the atmosphere. "There are farmers out there that are motivated to seek these solutions," Kramer says. However, the process of soil absorbing carbon can take hundreds or thousands of years when it occurs naturally. That's why Kramer and other researchers are looking for ways to speed up the process. And if they can? The results could be radical, Kramer says. Prior research by Kramer, as part of a team of researchers from the University of Georgia and the University of Florida, gives a taste of what kind of change he thinks could be possible. The study, published in 2015, documented how farms that transitioned from cropland to pasture land replenished carbon at a rate faster than anyone previously thought. Essentially, it's a rotational grazing system for cows. It increased the soil organic matter, improved soil quality and it resulted in "very rapid" carbon accumulation of 75 percent in six years, Kramer says. "That's a good example of what's achievable when we start rethinking things," Kramer says. Carbon sequestration hasn't been taken too seriously as a way to fight climate change because it takes so long for soil to naturally absorb carbon. To date, Kramer says they haven't found any solid solutions for how to accelerate the process. But Kramer hopes to build on previous research and find farming practices that can sequester carbon at an accelerated rate. It's not necessarily as feasible as reducing the burning of fossil fuels globally, he says, but he's hopeful. The original print version of this article was headlined "Groundbreaking"